FUEL EFFICIENT 36 MPG Hwy/26 MPG City! CARFAX 1-Owner, ONLY 24,404 Miles! CD Player, iPod/MP3 Input, Onboard Communications System, Smart Device Integration, Brake Actuated Limited Slip Differential, Flex Fuel, SIRIUSXM RADIO, TRANSMISSION: 6-SPEED POWERSHIFT AUTO... CLICK NOW! Back-Up Camera, Flex Fuel, iPod/MP3 Input, CD Player, Onboard Communications System, Aluminum Wheels, Brake Actuated Limited Slip Differential, Smart Device Integration. MP3 Player, Keyless Entry, Child Safety Locks, Steering Wheel Controls, Electronic Stability Control. TRANSMISSION: 6-SPEED POWERSHIFT AUTOMATIC, SIRIUSXM RADIO, CHARCOAL BLACK, CLOTH FRONT BUCKET SEATS 6-way manual driver (up/down, fore/aft, recline), 4-way manual passenger (fore/aft, recline) and removable adjustable headrests (2-way). 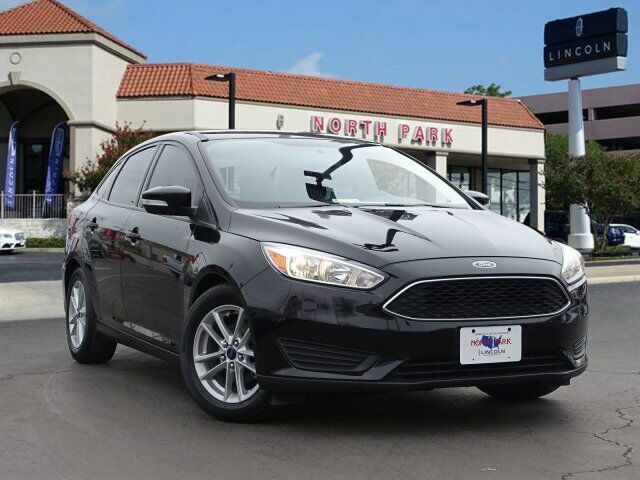 Ford SE with Shadow Black exterior and Charcoal Black interior features a 4 Cylinder Engine with 160 HP at 6500 RPM*. Edmunds.com explains When it comes to that elusive fun-to-drive factor, for example, you`ll find the Focus to be one of the more engaging cars in its class, with nimble handling that doesn`t come at the expense of ride comfort.. Great Gas Mileage: 36 MPG Hwy.